A correspondent alerted me to the passing away in December, in Roswell, New Mexico, of Frank H.H. King, Emeritus Professor of History at the University of Hong Kong. Frank is most famously the author of the authorised History of the Hongkong and Shanghai Banking Corporation, whose four volumes take up a good chunk of my book shelves. I last met Frank in 2003 when he gave a keynote address to a workshop on the life and legacy of Sir Robert Hart, long-time Inspector-General of the Chinese Maritime Customs, at Queen’s University Belfast. Frank had composed Hart’s entry in the Dictionary of National Biography, and his address was later published in Modern Asian Studies, in a set of papers edited by Hans van de Ven. As well as exploring the Boxer Indemnity, Frank also delivered an article explaining the origin of Hart’s obscure title for his book of essays pleading China’s case in the aftermath of the Boxer war: These from the Land of Sinim. I think we always need reminding of the religious universe in which these historical actors moved and thought. Frank also wrote me a characteristically affable note in 2005 telling me he had enjoyed Empire Made Me, even though I was ‘totally mistaken’ in my note about Chinese money. Explaining the cosmopolitan world of currencies in treaty-port China is never easy. People operated on paper and in the street with a complicated bag of paper notes, Mexican and other silver dollars, Chinese taels, and more. In preparing the book the safest way to approach this, I thought, was simply to relay the guidance from a contemporary guide-book, and that is what I did, choosing the Reverend Charles Darwent’s 1920 edition of his Shanghai: A handbook for travellers and residents, first published in 1904. Well, Frank went on, not only was I wrong, ‘so is the dear Rev Darwent’. Darwent, minister of the Union Church Shanghai from 1899-1919, was still fairly new to Shanghai, but Frank argued that ‘foreigners loved to see confusion in the [Chinese monetary] system as it tied in with their views of China in general’, and that anyway they, and ‘our own contemporaries do not have a clear view of money and banking today’. This seems persuasive, still, perhaps now much more so. Looking for his obituary online I found that Frank’s life was visually quite well-documented, most notably by a Flickr stream from Clay County Historic Sites, Missouri, where the life of his family is associated with ‘Historic Pharis Farm’. That’s him below, on the left at two weeks old: six years after the second edition of Darwent’s guide was published, when foreigners in China were still confusing themselves about Chinese money, and the treaty port system was still operating across the country, even though big shocks were on the way. Anyway, Frank wrote as he concluded the exchange, we should talk about it some time, as I clearly had much to learn. In the meanwhile he was sorry that I had missed his start turn as the Porter ‘in a local (New Mexico Military Institute) production of Macbeth. I played it as scripted but also for laughs. The cadets were mainly concerned that I not collapse on stage … I am the age of their grandfathers …’ He was then just 79. Frank H. H. King, London, January 1926. As I prepared to focus on the writing of Empire Made Me in the late 1990s I developed a database listing the names of just over 2,000 men. In 1999 I posted a version of it online, and broadcast the fact to a few family history websites. I have added to it over the years, and it now has details of some 2,745 men. 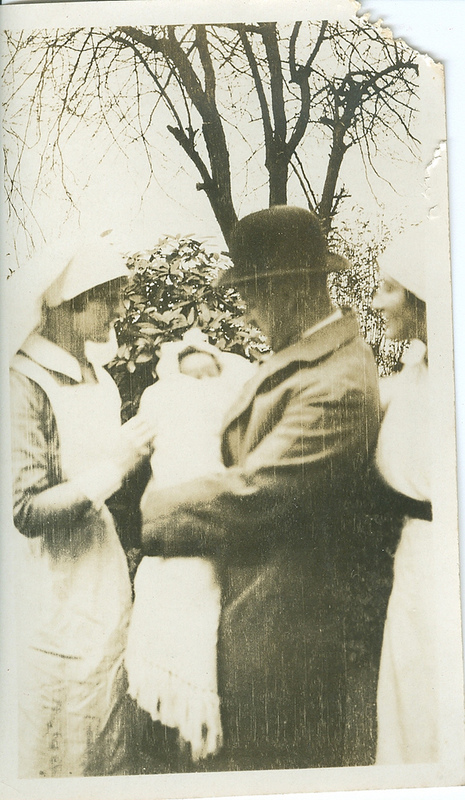 I thought that perhaps a few people might get in touch, and might have additional documents or information about the lives of the men that would help me better understand their lives, and so the context for Maurice Tinkler’s story. In return I would be able to tell them the basic outlines of their careers, and perhaps, where I had looked at personnel files, more information that might be useful. In fact relatives or descendents of a strikingly large proportion of the men have got in touch over the years. They have emailed or written from across the world, sending me details, documents and photographs. I have done my best to answer them all as fully as possible. This last Christmas season brought emails concerning another five men. My correspondents were in Canada, Australia, Hong Kong and the UK, and they asked about men who joined in the 1910s, 1920s and 1930s, who served for three years, and for almost twenty, who moved on elsewhere after their service, or who stayed in China: a good cross-section. Generally I have had additional information to pass on, although sometimes nothing more than that bare outline, date of joining, leaving, promotion to Sergeant etc. The information people have provided has immeasurably enriched my work, providing new data for the database, but more importantly a rich trove of stories, documents and especially photographs, many of which have found their way into the ‘Historical Photographs of China‘ collections. More than anything, it was the old Shanghai photographs which arrived as attachments which laid the groundwork for that project. Medal and gun collectors have also written, and policemen, as well as afficionados of unarmed combat, and knife-fighting. (Part of the SMP’s complex legacy was the work undertaken there by W. E. Fairbairn, and then taken into his service with clandestine warfare units during World War Two). More than data, perhaps, the flow of correspondence reminded me that I was dealing with a living story, with men and women still very much alive within family memories, and sometimes still very much alive, and with with their own strong views on the Shanghai saga. It was and remains a helpful corrective, keeping this historian alert to the fact that his work concerns people, and not simply characters from the dead archive. So keep those emails coming. Since completing the manuscript of Empire Made Me in March 2002, I have been a bit surprised to have come across or received very little by way of additional information on the subject of the book, Maurice Tinkler. In this and the next two posts I will present the tidbits that have arrived, gifts via email from interested readers. 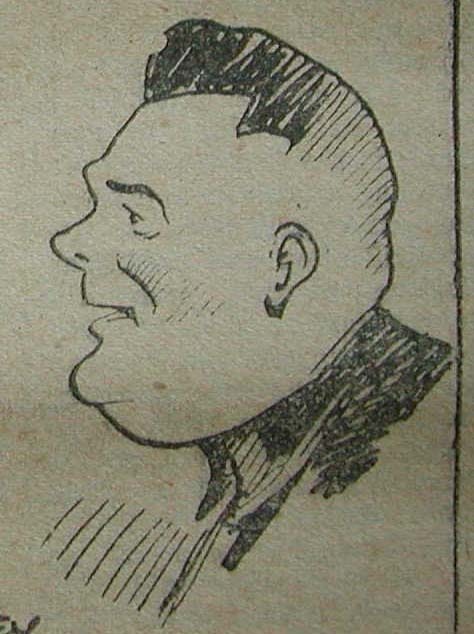 I was certainly unprepared for Maurice Tinkler the amatuer thespian, but here he is, skected by the wonderful Russian cartoonist ‘Sapajou’ (Georgi Sapajnikov) in the North China Herald. 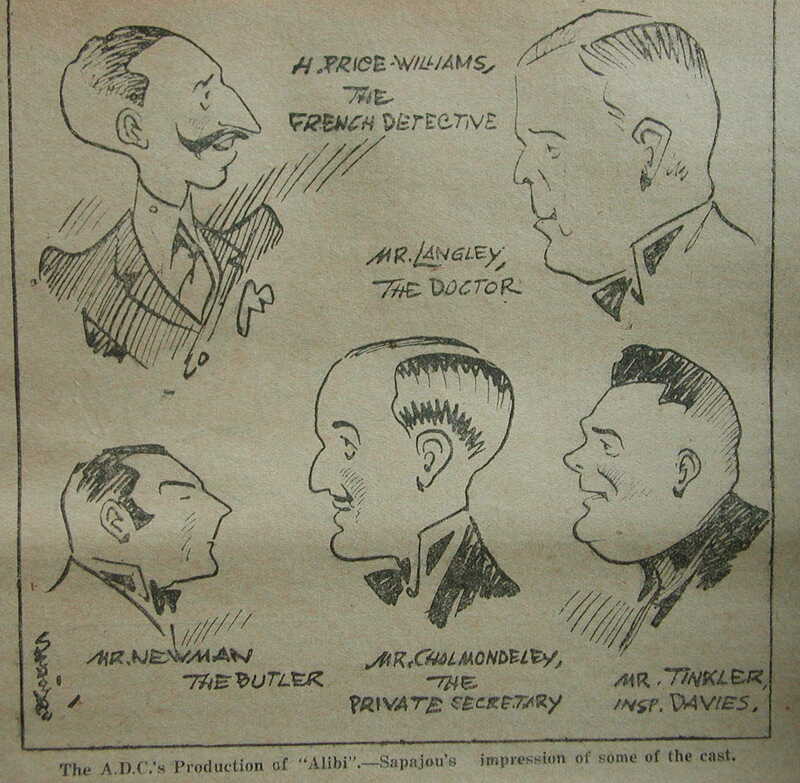 The date is April 1930, and the play is Agatha Christie’s ‘Alibi’, based on her book The Murder of Roger Ackroyd. Does it add to the picture? Perhaps it reinforces his ambivalent position within the foreign community at Shanghai. His fellow cast members are just the people he often railed against in his letters, yet here he is, playing at being one of them in the A.D.C. Tinkler had only just been promoted to Inspector, but since late the previous year he had been back in the uniform branch, after a decade in the detective branch and then the riot squad. At this stage, acting on stage was as close as he could get, or was ever again to get, to Maurice Tinkler, Shanghai detective.